Rolex Yellow Gold Plated President Bracelet. 0.9"End Piece width. Has the dog head stampon buckle. Total weight 52 grams. End piece number Geneva 1800. In very nice condition with light stretch. The watch features a silver dial with alpha hands. Aesthetically, the watch is in good shape and functioning with no issues. Rolex Oyster Perpetual Datejust 1601 - Gold "Pie Pan" Dial-. With a two tone band of stainless steel and gold, this mainly stainless steel watch with its golden "Pie Pan" dial makes for a stunning combination. Model: Datejust. This is an authentic Rolex watch with an Rolex 18k white gold fluted bezel, a custom stainless steel jubilee bracelet, and a Rolex dial with added genuine diamond markers. Dial: Rolex Dial with Added Genuine Diamond Markers. Rare 1940s Tissot Anti Magnetique Oversize Fancy Lug Black Dial Man's Watch NR! NO RESERVE! Recently serviced and running great. Excellent steel case back. Gorgeous black dial appears to be older refinish. Excellent crystal and crown. Fitted to a new, high quality DeBeer leather strap with steel buckle. Watch works perfect, never had any issues with it. Model: Submariner. Rolex Submariner 1680. Ref.No. : 1680. Papers: Original Rolex Papers. Box: Original Rolex Box. Glass: Plexiglass. Case Material: Stainless Steel. Case Size: 40mm. This is a beautiful 1995 Rolex Explorer 1 for sale! Water resistant to 10 ATM. There are no scratches on the dial or case and very minimal brushing on the band. I rate this watch a 9/10. All photos are of the actual watch for sale. MODEL: Datejust Oyster Perpetual 16238. Rolex Datejust 1 1 6238. Solid 18k Gold Oyster Perpetual. Jubilee Bracelet. STYLE: Jubilee Bracelet. DIAL COLOR: Champagne / Yellow Gold. CASE MATERIAL: Solid 18k Yellow Gold. We make every effort to describe each item to the best of our ability. Rolex Explorer II. Stainless Steel White Dial Gent's Quickset Wristwatch. and a white dial with luminous index / round hour markers and luminous hour, minute and 24-hour hands. Features a stainless steel 40 mm case and. Condition is Pre-owned. THIS IS SUPER RARE AUTOMATIC TUDOR WATCH MANUFACTURED BY ROLEX WATCH FROM WITH ORIGINAL SUPER RARE GOLD DIAL, SO DON'T PASS UP THE OPPORTUNITY TO ADD IT TO YOUR COLLECTION ! Condition is Pre-owned. Honeycomb dial. -Watch runs and is in working order, gains 30 seconds every 24 Hours. The two tone bracelet shows mild stretch. The date advances slightly shy of 12. Manufacturer: Rolex Tudor ;. Rolex Instructions. Band material: Stainless steel, 18k gold ;. Crown: Screw down signed ;. The owner of this watch is certain to set themselves apart from the crowd with their contemporary, yet refined taste, and elegance. The pictures do not do this watch justice. Dial:Factory Rolex Black "Error Dial II" Dial. Model Number: 5513. Atlanta GA 303 19. All photographs are from actual item. Case Model Number 74033 and Serial Number B324661 were struck at case side between 2 Lugs, 19mm Lug width to fit watch band. Crown : Wrapped 18K Gold Crown with ROLEX crown logo cast, in Excellent condition, Push-Screw Lock, with Quick-Set Date feature, in excellent working order. 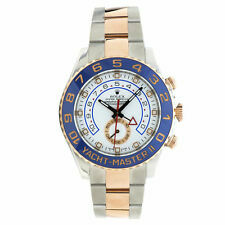 You are viewing the highly sought after Rolex Yachtmaster MODEL 116622 40 mm Platinum and SS watch with FACTORY BLUE DIAL. The watch barely looks used as there are hardly any marks, scratches or marks on the watch. Model: Datejust. This is an authentic Rolex watch with an Rolex 18k white gold fluted bezel, a custom stainless steel jubilee bracelet, and a Rolex dial with added diamond markers. Dial: Rolex Dial with Added Diamond Markers. HALLMARKED: Rolex 1002. REFERENCE #: Ref. However, we will accept Cashier's Checks if noted upon checkout. WEIGHT: 45.6 grams. This is not negotiable. Bluebonnet Rarities is an Estate purchasing firm traveling the United States looking for unique and interesting coins, estate jewelry, watches and antiques. We added new black leather non- Rolex strap with silver tone buckle. Running well, gains approx. All the words on dial Rolex Oysterdate Precision T Swiss T. Reference #: 6694 ;. Manufacturer: Rolex ;. The bezel insert has changed to a light grey blue color and is 100% original to the watch. 5.0M serial. The dial has turned to a matte grey and is beautiful. Lightly polished if any through the years. 18k Rolex President Bracelet Band. Condition is Pre-owned. Shipped with USPS Priority Mail Express. Pre-owned Gents Rolex Stainless Steel Oyster Perpetual Date Watch in excellent condition. The bezel is over 1.00 Ct. TDW and is SI clarity and G-H color. Sorry, No papers. Bell & Ross. Watch Warranty. Jewelry that has been sized, engraved or modified in any way cannot be repaired or serviced under this warranty. A. Lange & Söhne. Harry Winston. Franck Muller. Van Cleef & Arpels. Trending at $6,799.99eBay determines this price through a machine learned model of the product's sale prices within the last 90 days. Rolex Fluted Solid 18K Yellow Gold Bezel. Rolex Black Stick Dial. Serial Number 6,6 , (Serial dates to a 1981). Band Custom Black Leather Strap. Box Yes, this item includes an elegant watch case. Reference #: 7950 ;. The Oyster Prince 34 is highly sought after by Rolex Tudor collectors because they often have very cool dials. This one has an original two tone dial with sun rays on the outer portion, marked Swiss at the bottom and is also gold and steel which is almost impossible to find. A 1931 Rolex Oyster Stainless Steel mans wristwatch on an old worn leather strap. marked 40414 15 rubies Rolex on works and 6244 on inside back plate and 923213 on edge. 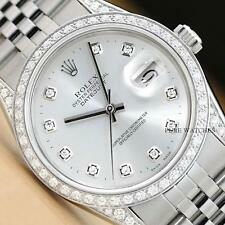 MENS ROLEX DIAMOND DATEJUST 1.9 CT DIAMOND BEZEL AND ROMAN BLEU DIAL Exquisite.. Condition is Pre-owned. Shipped with USPS Priority Mail. 5 out of 5 stars - MENS ROLEX DIAMOND DATEJUST 1.9 CT DIAMOND BEZEL AND ROMAN BLEU DIAL Exquisite. 5 product ratings5 product ratings - MENS ROLEX DIAMOND DATEJUST 1.9 CT DIAMOND BEZEL AND ROMAN BLEU DIAL Exquisite. 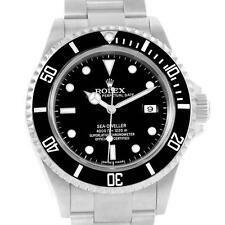 Up for sell is a Rolex DeepSea Sea Dweller 116660 Automatic Mens 44mm Stainless Watch. Condition is Pre-owned. Some light scratches, polishing should take them out. Small scratch on the glass but you hardly notice it, please see all pictures. This watch looks amazing, Box and papers included. No international bidders, thx for looking. Watch will be shipped insured w/ signature required. MODEL: Datejust, 1603. It has a black dial with a 14k gold fluted bezel and a dual toned steel/14k gold Rolex Jubilee band. It's a lovely piece in good condition with no stretch in the band. There is one minor defect on the crystal edge near the 2pm position. Keep track of your busy schedule with a Rolex men's watch. These men's watches are often wider with larger faces for an eye-catching appearance. Versatile and timeless, black band wristwatches are effortlessly iconic signature timepieces. Impressive in their simplicity, they have a traditional appearance for a perfect wardrobe staple. White gold band watches will add instant style to any ensemble. With popular designs, they are great if you're looking for a fashionable style. PVD coated band wristwatches are designed with very strong materials for added durability. PVD coated bands are resistant to corrosion, so they will look great for years to come. Entirely made of gold, the bands are highly precious and beautiful. Featuring a traditional band, genuine leather band wristwatches are must-have timepieces for any watch collection. 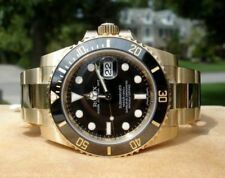 Which Rolex men's wristwatches are the most popular among eBay shoppers? With their modern styles, stainless steel case watches are fantastic for upgrading your wardrobe. Constructed with scratch-resistant designs, they are less likely to get damaged by any accidental drops. Solid gold case watches are designed with precious materials, giving these timepieces additional value. With traditional styles, they are versatile accessories that you can wear whether you're enjoying a day at home or a night on the town. Valentine’s Day is for sharing the love, whether it's with a partner, a close friend, or a family member, so shop for Rolex men's watches to celebrate it right.